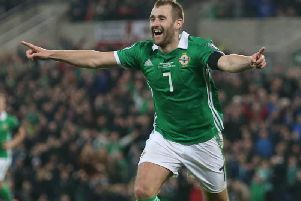 Northern Ireland advanced to the knockout stages of Euro 2016 on Tuesday night and Gareth McAuley lauded the achievement of a country many thought would only be on a brief French sojourn this summer. In their first major tournament since the 1986 World Cup, Michael O’Neill’s side progressed to a clash with either hosts France or Wales at the weekend, despite a 1-0 loss to Germany in the Parc des Princes. A win over Ukraine in Lyon last Thursday, coupled with a final goal difference of zero, saw Northern Ireland claim one of the best third-placed berths and veteran McAuley was delighted to see his nation progress at their first European Championship finals. “It’s an absolutely incredible achievement by everyone involved,” McAuley said after learning they had advanced en route back to Lyon. “(Aaron) Hughes had 102 caps, he’s not played a lot of football, he’s come in and had two amazing performances for us. There’s loads of little personal, collective things from all the lads. “We’re just pleased that everyone can come back again and have a party at the weekend. Despite the loss, the slender margin of defeat proved crucial and goalkeeper Michael McGovern was a large reason for the narrow reverse. The soon to be out-of-contract Hamilton stopper made brilliant saves from Thomas Muller, Mario Gotze and goalscorer Mario Gomez to stop the floodgates from opening in a performance which prompted applause from his team-mates as soon as he returned to the dressing room. “If you take into account the stage we’re on and the level of opposition, I really enjoyed it,” McGovern added when asked if it was his best-ever performance. “I enjoyed the challenge, I’ve enjoyed the other games as well. The tournament has been more than we could have imagined. “The players gave me a round of applause when I came in; that was really nice. “It was great to have my family there, my wife and my wee boy, my mum and dad and a few others.